1982 was a really good year for sword & sorcery. “Conan the Barbarian” was released, then came Ator. Before either of those two appeared, Marc Singer hit the big screen. Once again, I freely admit I was really into the whole big-sword-and-lots-of-muscle look. 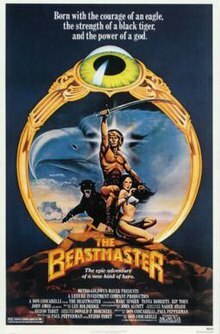 As plots go, Beastmaster does have some worthwhile variations on the usual “You burned down my village. Prepare to die.” storyline. Follow along with me as I point out the highs and lows. In the kingdom of Aruk, the vicious high priest Maax [MAY-aks] (Rip Torn) had set his designs to conquer the city, but is warned by his witch underlings that he would die facing the son of King Zed (Rod Loomis). Learning of Maax’s scheme to murder his child as a sacrificial offering to the cult’s god Ar, Zed exiled Maax and his followers to the wilds. Exile? No no no. Pardon me, Your Highness, but the word you’re looking for is Execution. However, Maax sent one of his witches to transfer the unborn child from the womb of Zed’s queen (Vanna Bonta) and into a cow to be born. Watching this happen completely freaked me out. I’d never seen such a thing done before, not even in a horror movie. The witch brands the infant with Ar’s mark, but is killed by a poor villager who takes the infant in his care and raises him as his own son. Named Dar while raised the village of Emur, the child learns how to fight while advised by his father to keep his ability to telepathically communicate with animals a secret. Yes, that is correct. Dar can read the thoughts of animals and communicate with them. Why this untrained talent doesn’t drive the poor kid insane is an issue that’s never really examined. Years later, a fully grown Dar (Marc Singer) witnesses his people being slaughtered by the Jun, a horde of fanatic barbarians in league with Maax. Dar, the only survivor of the attack, vows revenge and journeys to Aruk to avenge his people. In time, Dar is joined by an eagle that he names Sharak, a pair of thieving ferrets he calls Kodo and Podo, and a black tiger whom he names Ruh. Yes, this is a fantasy world, but you’re still not going to find these three creatures in the same ecosystem. Eagles prefer lakes, rivers, shorelines for foraging. Ferrets like to live in prairie dog burrows, which means dry prairies with short grass. Tigers are found in swamps, grasslands, and rain forests. Eventually, Dar meets a redheaded slave girl called Kiri (Tanya Roberts) before getting himself lost and ending up surrounded by an eerie half-bird, half-human race who dissolve their prey for nourishment. As the bird men worship eagles, they spare Dar when he summons Sharak and give him an amulet should he need their aid. Another original creature, these humanoid birds swoop down, close their wings around their prey, then open their wings to drop bones that looked eaten by acid. Creepy! Dar soon arrives to Aruk where Maax had assumed total control with the Juns’ support and subjects the people to witness their child being sacrificed. After having Sharak save the child of a townsman named Sacco, Dar learns that Kiri is to be sacrificed. On his way to save her, Dar is joined by Zed’s younger son Tal and his bodyguard Seth (John Amos), learning that Kiri is Zed’s aunt as the three work to save her. Wait a minute. Kiri is the King’s aunt? That makes her Dar’s great-aunt, yet she’s young enough to be around Dar’s age. Sounds to me like somebody in the royal family has been playing fast and loose with the usual consanguinity laws. I guess Ator isn’t the only one willing to marry into his own family! While Seth goes to gather their forces, Dar helps Kiri and Tal infiltrate the temple and save the now eyeless Zed and while escaping from the temple’s beast-like Death Guards. Consumed by revenge, Zed refuses to listen to Dar’s warning against ordering an immediate attack on the city and rejects him as a freak. Forced to leave, Dar later learns that his friends are captured and races to Aruk to save them from being sacrificed. In the conflict that follows, Maax reveals Dar’s relationship to Zed before slitting Zed’s throat and facing the Beastmaster. Despite being stabbed and revived by his remaining witch before she was killed, Maax is about to kill Dar. Kodo sacrifices himself to cause the high priest to fall into the sacrificial flames. Say what? The mighty telepathic Beastmaster does not defeat the evil High Priest? That’s right. Maax gets a faceful of enraged ferret and topples over into the fire pit. That wins my award for Most Humiliating Defeat by a Furry Sidekick. But the victory is short-lived as the Jun horde are approaching Auruk, arriving by nightfall to face the trap Dar and the people set up for them. Tal gets wounded as Dar succeeds in burning most of the Juns alive while defeating their chieftain. The bird-men arrive to consume those remaining. The following day, though Seth has learned that Dar is Zed’s first born, Dar explains that Tal would make a better king. Dar sets off into the wild with Kiri, Ruh, Sharak and Podo (who has given birth to two baby ferrets) on the path to new adventures. So Our Hero, a proven fighter and Beastmaster, leaves his entire kingdom to his little brother who doesn’t even shave yet. Instead, Dar takes off with Kiri, who is still his great-aunt, along with the menagerie. Note the addition of two baby ferrets, adding a bittersweet note to the loss of the valiant Kodo. Beastmaster is a lot of fun. Sure, if you compare it to the first Conan movie and some of the Sinbad movies with Ray Harryhausen’s creatures, it’s not so great. That doesn’t mean you can’t spend two hours laughing and shuddering and cheering as you watch good triumph over evil. Ohmygod, I remember this! It’s been year but wow, what a trip. I used to watch that show religiously. Thanks for the flashback. You’re welcome! Thank you for the visit! And what with Dar, Tal, Zed, Maax… think I’m lost. Marc Singer’s sword fights are worth watching. I hope they paid his stunt doubles extra, between all the fights and rolling around with the black tiger! Great movie! Although the sequel will always have a place in my heart as my ultimate “I guess I’ll leave this on” movie. I am ashamed to admit I have not seen the sequel. I’ll have to do something about that! It’s worth at least one viewing. The ferrets steal every scene they were in, true. There’s a saying in Hollywood about never appearing with children or animals because they get all of the audience’s attention. Thank you for the reminder of why I loved this so much. Oh I miss Marc Singers abs! I’ll be honest I’ve never seen this… I may have heard of it… it seems to ring a faint bell in the deepest recesses of my mind. Have you seen the live action He-Man movie starring Dolph Lundgren? Oh my goodness. Not one of the high points of his career. It has been FOREVER since I’ve seen this show, but I remember those humanoid birds. They freaked me out!! Though, between Beastmaster and Ator, I’d go with the Ator look, haha…. Good for you! Read up on the mistakes and outtakes and see if you can spot them while you’re watching.